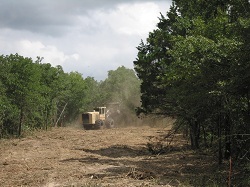 Garney Construction Company completed constructing the initial 53 mile Cross County Water Supply Corporation pipeline from the Project Area to the Austin Metroplex/Central Texas region on May 23, 2011. The pump station and well field facilities were completed on July 1st. 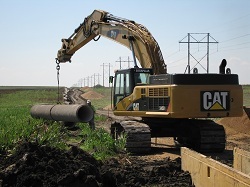 Garney began delivering pipe to the pipeline alignment on June 2, 2010. 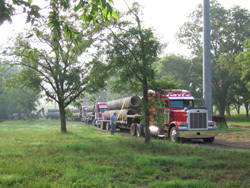 The last four truckloads of pipe were delivered to the alignment on March 3, 2011. Since June 2, 2010, approximately 2,017 truckloads of pipe were required to deliver the 282,487' (53.501 miles) of pipe to the alignment. The first pipe laying crew began laying pipe on July 6, 2010. The second pipe laying crew began laying pipe in mid August 2010. The 2 pipe laying crews were able to complete the construction of the pipeline in a record setting 10½ months. This transmission line begins at the PW-1 well field on County road 319 near FM 908 in Burleson County and terminates at the elevated storage facility near Manor, in Travis County. 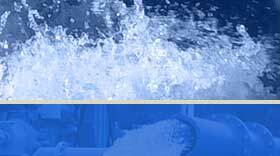 The pipeline and related pump station and storage facilities are owned and operated by Cross County Water Supply Corporation, a member-owned non-profit company.